Is ONE OK ROCK’s TAKA dating former figure skater Mai Asada? Watch the live-action short for Yasuhisa Hara’s Kingdom now! They hype is on for the Hanadan sequel “Hana Nochi Hare ~ The Next Season”. The drama premieres April 17 on TBS (Tuesdays, 10pm) and teaser trailers and character visuals have been released. Take a look at the cast with Sugisaki Hana playing the new heroine Edogawa Oto. King & Prince’s Hirano Sho will take on the leader of the group C5, who now rules Eitoku Academy, and Nakagawa Taishi will play Oto’s fiance and the student council president of a rival school. King & Prince’s debut song “Cinderella Girl” which will be released on May 23 is featured in the teaser trailers. The other cast who make up C5 are Suzuki Jin as Narumiya Issha, Hamada Tatsuomi as Taira Kaito, Imada Mio as Mayu Airi, and Nakata Keisuke as Eibi Sugimaru. Iitoyo Marie will play as Nishidome Megumi, a popular model who transfers to Eitoku Academy to get closer to Haruto. Sasaki Sumie and David Ito from Hana Yori Dango will also appear in the drama, reprising their roles as head maid Tama and secretary Nishida. The setting of the drama takes place 10 years after the F4 graduated from Eitoku Academy. Edogawa Oto (Sugisaki Hana) is the daughter of a former company president. Her life completely changed after their family business went bankrupt. Her fiance is Hase Tenma (Nakagawa Taishi), the popular student council president of the rival school. 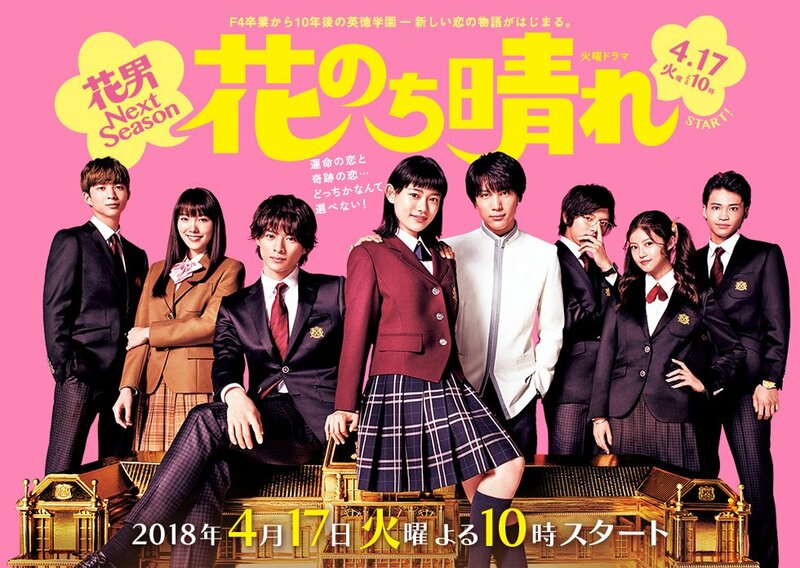 With declining enrollment due to a recession and the rise of a rival school, Eitoku Academy is now ruled by the Correct 5 whose leader is Kakuragi Haruto (Hirano Sho). The group seeks out, then runs out, any students whose families haven’t made appropriate donations to the school. When Haruto and Oto discover each other’s secrets — that Haruto buys self-help items to get stronger, and that Oto is poor and works at a convenience store – they promise to keep each other’s secret.